George is the principal dentist and owner of the dental clinic. After completing his first degree in technology of prosthetics, he went on to study dentistry at the University of Athens,Greece. He qualified in 2000, and has been practicing dentistry ever since. He is a member of the Dental Associationof Attica. With almost a decade and a half of experience and continual ongoing training in the latest technologies and techniques both in Greece and abroad, you can be sure you are in safe hands. His caring and gentle ways puts even the most nervous patients at ease, while his meticulous and thorough approach grants them an unrestrained and confident smile. In addition to general dentistry, George has a special interest in cosmetic dentistry and prosthetics. He divides his spare time between his wife and his three daughters, listening to music and hunting for hidden treasures for his extensive record collection. George is an Oral & Maxillofacial surgeon with studies both in Medicine and in Dentistry. He holds a Phd in Molecular Biology of Oral Cancer from the University of Athens and a Msc in Oral and Maxillofacial Surgery from the University of Manchester. After obtaining his degree in Dentistry from the University of Athens in 1998, he pursued a long path of studies and clinical practice in acclaimed hospitals, which included a degree in Medicine from the University of Ioannina in 2009. Since 2001 he has been practicing Dentistry and Oral and Maxillofacial Surgery in hospitals and in private clinics both in Greece and the UK. 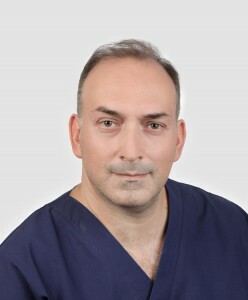 He has participated in many research and clinical activities in cooperation with various international institutions, such as the Head and Neck-Skull Base Surgery department of the University of Kosice Slovakia and the Department of Oral & Maxillofacial Surgery of Aintree Hospital in Liverpool and recently the Department of Plastic and Reconstructive Surgery at the Hospital of Taipei. He has published several articles in acclaimed medical journals available through pubmed-medline. George’s vast experience and extensive knowledge of the anatomy of the human skull, allows him to craft the most appropriate treatment plan. He then executes it skilfully ensuring high implant success rates. He is competent, gentle and you will immediately feel in safe hands. He is married and in his spare time enjoys spending time with his two young children.